For integration with all Oracle Fusion based Cloud services – like Oracle Sales Cloud and Oracle SCM Cloud, each service provides Business Events which external applications or integrations can subscribe to. Oracle Integration Cloud Service (ICS) or the new offering Oracle Integration Cloud (OIC) allow very easily to receive (subscribe) to these events and forward them, for example, to external applications. Following a previous A-Team post on Chronicles on Sales Cloud Events, we will give an update on Release 13 and how to use the event filters. 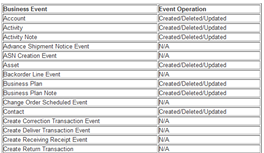 One example would be to publish an event every time a new item in SCM is created. With this event, a call to ICS/OIC is executed which triggers an integration. The easiest way of subscribing to business events is by using the Oracle Sales Cloud Adapter or Oracle ERP Cloud Adapter (for SCM) in Oracle Integration Cloud Service (ICS). In the prior release of FA-based solutions – Release 12 – you had to create separate connections for each pillar (CRM, SCM, ERP). This has changed with R13 – now there is a single Service Catalog WSDL URL and a single Events Catalog URL – which simplifies creation of event subscriptions. In this blog series, I will give an update of the new events available, how to subscribe from ICS – or the new Oracle Integration Cloud (OIC) offering – and how to use Event Expressions to filter only specific events to subscribe to. This is a list of all Business Events in an R13 GSI instance you can subscribe to (this version is based on Update 17C): Read the complete article here.